What’s the difference between eczema and atopic dermatitis? Eczema is a general term encompassing various inflamed skin conditions. One of the most common forms of eczema is atopic dermatitis (or “atopic eczema”). Approximately 10 percent to 20 percent of the world’s population is affected by this chronic, relapsing, and very itchy rash at some point during childhood. In general, atopic dermatitis will come and go, often based on external factors. Although its cause is unknown, the condition appears to be an abnormal response of the body’s immune system. In people with eczema, the inflammatory response to irritating substances overacts, causing itching and scratching. Eczema is not contagious and, like many diseases, currently cannot be cured by drugs. However, for most patients the condition may be managed well with laser treatment along with temporary avoidance of triggers. What does eczema look and feel like? Although it may look different from person to person, it is most often characterized by dry, red, extremely itchy patches on the skin. Eczema is sometimes referred to as “the itch that rashes,” since the itch, when scratched, results in the appearance of the rash. Eczema can occur on just about any part of the body; however, in infants, eczema typically occurs on the forehead, cheeks, forearms, legs, scalp, and neck. 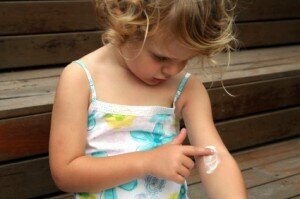 In children and adults, eczema typically occurs on the face, neck, and the insides of the elbows, knees, and ankles. In some people, eczema may “bubble up” and ooze. In others, the condition may appear more scaly, dry, and red. Chronic scratching causes the skin to take on a leathery texture because the skin thickens (lichenification). What makes patients with eczema itch? Many substances have been identified as itch “triggers” in patients with eczema, and triggers are not the same for every person. Many times it is difficult to identify the exact trigger that causes a flare-up. For some, it seems that rough or coarse materials coming into contact with the skin causes itchiness. For others, feeling too hot and/or sweating will cause an outbreak. Other people find that certain soaps, detergents, disinfectants, contact with juices from fresh fruits and meats, dust mites, and animal saliva and dander’s may trigger itching. Upper respiratory infections (caused by viruses) may also be triggers. Stress can also sometimes aggravate an existing flare-up. Eczema occurs in both children and adults, but usually appears during infancy. Although there is no known cause for the disease, it often affects people with a family history of allergies. Those who are genetically predisposed and then exposed to environmental triggers may develop eczema. Many people who have eczema also suffer from allergic rhinitis and asthma, or have family members who do. The National Institutes of Health estimates that 15 million people in the United States have some form of eczema. About 10 percent to 20 percent of all infants have eczema; however, in nearly half of these children, the disease will improve greatly by the time they are between five and 15 years of age. Others will have some form of the disease throughout their lives. What can be done for children with eczema? Children are unique patients because it may be difficult for them to resist scratching their eczema, thereby making the condition worse. Avoid as many eczema triggers as possible. Keep your child’s skin moist. After bathing, apply moisturizer within three minutes to retain the moisture in the skin. Avoid sudden temperature changes. Keep your child’s bedroom and play areas free of dust mites (a common trigger). Use mild soaps – both on your child’s skin and on your child’s clothing. Dress your child in breathable, preferably cotton, clothing.